IF YOU ARE NOT A FL PRO, READ THIS ARTICLE!! Lakeland Outdoor Courts; Come and Enjoy!! Yes, you must pay a small amount to register to play, ($6.00 I believe) but even if you lose your first match, you get to play another!!! That gives you more than $6.00 worth of exercise and experience!! We are now up to lunch time; better bring your lunch!! You will need the energy!! This event is classified as an Any Doubles; that means you can take any partner you wish. Heck, why not take your wife, or even your friend’s wife??? Don’t let me mislead you! Your desire, your enthusiasm, and your judgment will all be tested!! And, if you find out it is “your cup of Tea”, you will be pleased to know that there is one such event just about every Monday, from now until March 14th, 2018. I told you in paragraph two that the event is open to all amateur shufflers in the State; the tournament to be held the “next week”, 2017 11 13, will be held in two different locations > Betmar and Lee County!! 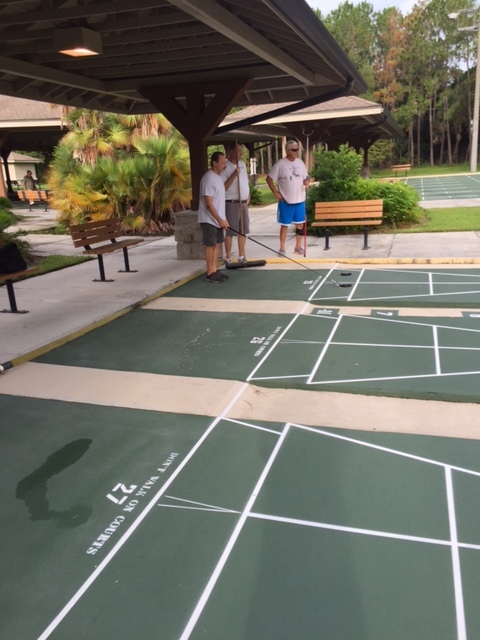 To become familiar with the full season schedule, go here: http://www.fsa-shuffleboard.org/schedules/AmSched2017-18.htm AND if you need directions to either of the two locations, click on the destination of your choice. Let’s say you decide to “go west”, that is to Lee County. Click on Lee County and Google will take you there!! If you have a specific question, send me an e-mail and I will do my best to answer. Stanistheman_200@yahoo.com If you DECIDE TO GO, do me a favor and send me an e-mail telling me how much you enjoyed the event!! Stan McCormack. 2017 11 02.